I came across this book during my undergraduate days. My mother, then working in the post-graduate library of the University of Delhi, got the book issued on her staff card. I had heard some nice things about the author and asked her to get one of his books for me to read. In an Antique Land was her random pick. There couldn’t have been a better choice in so far as creating a first impression about the writer was concerned. 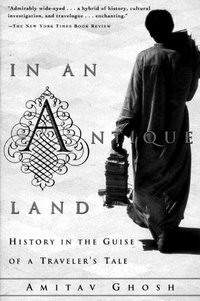 The book’s subtitle is: History in the guise of a traveller’s tale, and it is just that. What starts off as an unassuming yet highly entertaining travelogue told in first person by Ghosh, who finds himself in Egypt as an anthropology research scholar, gradually winds its way through the alleyways of history going back to 7oo years. How so? Well, we are introduced to the story of Bomma, an Indian slave, who had travelled to the Middle East, and lived along the coast of Nile, all those centuries ago. From this point, the book shifts between the two narratives–that of Ghosh, the research scholar-traveller, who records his observations on modern Egyptian life with fascinating detail and curiosity; and of the history of Bomma, the slave. Then at some point, the two narratives find a common ground, and for the reader, it becomes as gripping as a well-plotted detective story. As Ghosh pieces together history, travel and the cultural conflict in the Egyptian society (the tug between conservative values and modern-day desires), he crosses boundaries of genre and emerges a trailblazer of a writer. The manner in which Ghosh juxtaposes history with travel narrative in this book is outstanding. To keep readers engaged on two different story tracks without confusing them requires finesse of the highest order, and Ghosh displays that in a most effortless way. The book, while being non-fiction, has some fictional elements and is only richer on that account. What’s more, in the atmosphere the author creates for the reader, history, present-day facts, and fiction, all blur and merge together a lot of times in the book, making it intriguing. Like I said, this was the first of Amitav Ghosh books I read, and I was simply blown over. I would easily rate him amongst the finest of modern-day English writers. I am yet to read his fiction, but even as I write, I am spending my reading time getting engrossed in a section of his book The Imam and the Indian, reprinted in a Granta Book of Travel edition. Once again, I am not disappointed. Amitav Ghosh belongs to a rare breed of writers. The main characteristic of these writers is, once you read one of their books and get charmed, you expect them to repeat the act in other works. The good news is, they always deliver. Note: This is the first of my posts on some top-quality non-fiction books I have read. It is a follow up to my post Not Fiction? Not a Bore.